One of the most obvious applications for mathematics in day-to-day Canadian society is the understanding and manipulation of money. This unit focusses heavily on this application, with particular attention to the mathematics of interest, annuities, investments and loans. To do this, students will start by studying a special family of functions - the exponential functions - in depth. Before delving into money matters, they will use exponential functions to model a number of real-world phenomena, such as population growth and radioactive decay. 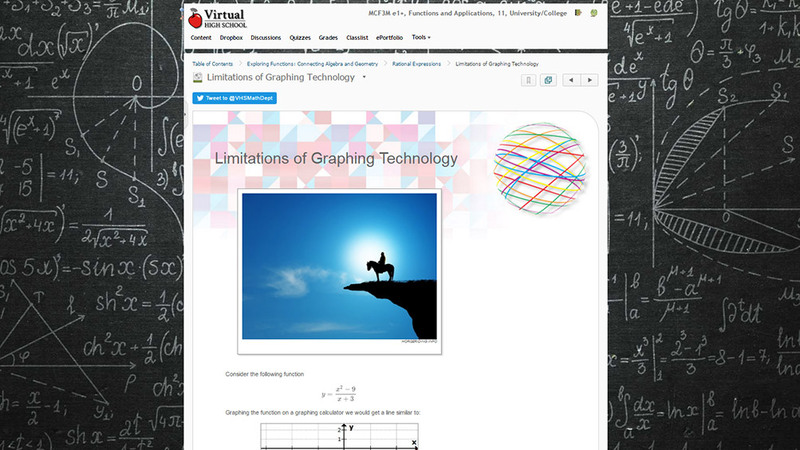 As with quadratics, they will relate the numeric, graphical and algebraic representations of exponential functions. Finally, they will intensively investigate simple interest, compound interest, annuities, and solve realistic problems related to these tools of finance. A3 solve problems involving quadratic functions, including problems arising from real-world applications. B3 demonstrate an understanding of compound interest and annuities, and solve related problems. C3 identify and represent sine functions, and solve problems involving sine functions, including problems arising from real-world applications. Problem solving: This course scaffolds learning by providing students with opportunities to review and activate prior knowledge (e.g. reviewing concepts related to quadratic equations from prior mathematics courses), and build off of this knowledge to acquire new skills. The course guides students toward recognizing opportunities to apply knowledge they have gained to solve problems. Connecting: The connects the concepts taught to real-world applications, such as simple harmonic motion and sound or light waves.